When my daughters were young, one of their favorite books was “Sonya’s Mommy Works”. Here’s a synopsis from goodreads. It’s a great book, by the way. If there’s anyone in your life under the age of, say, nine or ten, I highly recommend getting it for them. My parents were not like Sonya’s. They were great parents (we even had a summer house! ), and I loved them, but they were not cool. They were not young. And instead of traveling to far-flung locations like Sonya’s mother, no, my mother worked in the principal’s office at my elementary school. My parents were very big on telling the truth, and I’ve always prided myself on honesty, so I’ll be honest now. Having my mother work at the school sucked. There were 500 students, and I swear that if I so much as dropped a gum wrapper, somehow, she saw me. I used to think (actually, I still do) that she had either installed hidden cameras or possessed some sort of magical powers that allowed her, Super-mom like, to see around corners, through brick walls, and leap through the space/time continuum to catch me misbehaving. Most of my transgressions were of the minor variety, until third grade, when I involved myself in a caper that haunts me to this day. We are 100% Greek. I actually spoke Greek before I spoke English; my first words were “I see it!” (το βλέπω, if you must know). It’s pronounced “Too Vlee-eh-poh” – kind of. By third grade, I’d lost most of my ability to speak Greek, and since then, it hasn’t improved. That year, a new transfer student from Greece arrived at the school; he was “right off the boat,” as my family would say, although I have no idea what mode of transport his family used to get here. The reason I have no idea how they got here is because, of course, we had a language barrier; he couldn’t speak any English and I spoke very little Greek. 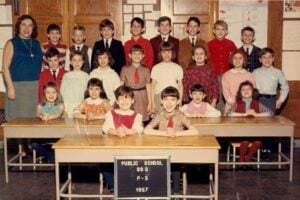 Me, second row, far left, in the turquoise dress. Photo credit http://kewgardenshistory.com/ss-schools/PS99-1967-gradeP-3.html. The new student arrived for his first day and met with the principal and, of course, his secretary, my mother, because, Greek! The principal looked through the files to find a student buddy for the new arrival, and there I was, in all my dishonest glory. You might think that my mother would have explained the situation to the principal. You’d be wrong. I bet Sonya’s mother would have. Nope, not my mother. She saw a perfect opportunity to teach me once and for all about the importance of telling the truth, with a little Fear Factor thrown in for good measure. I was summoned to the principal’s office to meet the new student. I have no idea what his name is, but we’ll call him “Nick”, since 80% of Greek boys are named “Nick.” Not really, but it’s a safe guess. Nick looked nervous and excited; the principal, grateful; my mother, triumphant. My mother wasn’t about to let me off the hook. I bet Sonya’s mother would have helped Sonya out. Finally, I composed myself, told the truth, and apologized to the principal. Nick looked crestfallen.